The referendum held on January 9, 2011, was a milestone for Sudan. With an overwhelming majority of 98.3 percent, southerners decided to secede from the north and to create Africa's youngest state—the Republic of South Sudan. While this momentous development was expected to end Khartoum's decades-long struggle with the southern Sudanese rebels, it has set off a number of ticking time bombs and exacerbated existing conflicts. On top of Sudan's financial problems and the wider impact of the Arab upheavals, President Omar Bashir's government is now facing a number of pressing issues in the post-referendum era. With the rise of new disputes and the escalation of protracted conflicts, is Bashir's Sudan on the verge of further instability? While rebel factions jockey for power, and President Bashir's northern Sudan government seeks to undermine resistance, conditions in Sudans's internal displaced persons camps worsen. 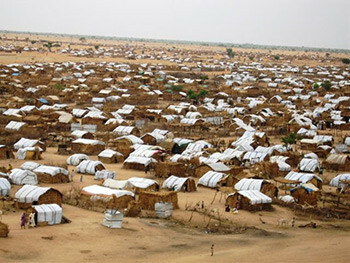 The Zam Zam camp in Darfur is one of the world's largest refugee camps, home to more than 200,000 residents. The most contentious and pressing problem confronting Khartoum is undoubtedly finding a solution to the Darfur conflict. The success of the southern Sudanese struggle for independence has had an impact on the Darfur movements, which quickly intensified their ties with the nascent southern Sudanese state. Historically, the Darfur movements have been influenced by and have had good relations with the anti-Khartoum southern Sudanese rebel movement, the Sudan People's Liberation Movement (SPLM). For instance, at the inception of Darfur's Sudan Liberation Army (SLA), John Garang—then-leader of SPLM—offered it logistical support, including weapons. Indeed, the SLA manifesto of 2003 was an echo of Garang's own vision of a "New Sudan." Similarly, Suliman Arcua Minawi (known as Minni Minawi), the only Darfurian rebel movement leader to have signed a peace accord with the Sudanese government in 2006, moved to Juba, the South Sudan capital when he decided to end his partnership with Khartoum in December 2010. Indeed, Darfurian movements had been using South Sudan as safe haven for quite some time until the local authorities asked them to leave in late 2010 under pressure from Khartoum. By way of coercing the south to stop its support for the Darfur rebels, since December 2010 the northern Sudanese forces reverted to air strikes against both the movements' main routes to the south and their likely safe havens there. Thus the referendum added fuel to the fire and inspired the Darfur rebels to unite their military forces against Khartoum. For the first time, major rebel movements such as SLA/MM (the Sudan Liberation Army's branch under Minni Minawi's control), SLA/AW (the faction under the leadership of Abdul Wahid al-Nur), JEM (Justice and Equality Movement), and LJM (the Liberation and Justice Movement) formed coalitions and have been fighting against the Sudan Armed Forces (SAF) since early 2011. In addition to some external factors, notably pressure from the international community, the January referendum also played a role in pushing the rebel movements to form political pacts. Previous attempts at pacts had failed due to power struggles between the groups. But in early 2011, several formerly adversarial organizations united and declared their support for a northern democratic state. In March, the JEM and LJM, which had agreed to participate in ongoing peace talks in Doha, signed an agreement to coordinate their positions in future negotiations. Khalil Ibrahim's JEM and Minawi's SLA/MM faction signed an agreement to unite their political resistance to the government, demanding a modern, secular, democratic state, which would resolve both the Darfur issue and Sudan's problems in general. JEM also confirmed their contact with Abdul Wahid, in a demonstration of the groups' determination to bring all Darfur movements together. By the same token, Abdul Wahid's SLA/AW faction, worried about losing its grassroots support given Abdul Wahid's long exile in France, announced its readiness to unite with the other armed movements in Darfur and, equally important, emphasized its willingness to reunite with Minni Minawi. Indeed, in mid-May Abdul Wahid and Minni Minawi announced their alliance and vowed to strive together to establish a democratic regime in Sudan. In the same month, a breakaway faction of the LJM and SLA/MM signed a coordination agreement to unify their armed resistance, and a number of SLA splinter groups such as SLA/Juba Unity and SLA/Mother reunited with SLA/AW. A final significant development was the integration of an Arab group, the Revolutionary Democratic Forces Front (RDFF) with SLA/AW in May. All these developments indicate that the Darfur movements are not only reorganizing among themselves, they are also integrating other anti-government factions, including Arabs, against Khartoum. In order to weaken the Darfur armed groups, the northern Sudanese government made two major decisions. The first was the "New Darfur Strategy," approved by the government in July 2010, which sought to end the Darfur conflict through a skillful use of sticks and carrots: heavy strikes against rebel forces accompanied by economic incentives for the civilian population. To this end, Khartoum has announced a large number of investments and initiatives in the region, some of which have been actualized while others remained dormant. The second and most recent government initiative was the creation of two new states—Central and East Darfur—in addition to the three existing ones in the north, south and west. According to the 2006 Darfur peace agreement, the government will hold a referendum on the permanent status of Darfur, in which Darfurians will be given two choices: 1) retention of the status quo, in which the three existing states will continue to be directly responsible to the central government; 2) creation of a Darfur region composed of the three states under the Darfur Regional Authority which will be responsible to the government. The government is in favor of the first option as it consolidates its control over the states and, further, facilitates creation of two more states. Khartoum argues that increasing the number of states will give local leaders the ability to develop closer relations with their constituents, and the internecine disputes will be more effectively resolved. According to the government, peace can only be achieved from the grassroots up. Hence President Bashir held meetings with Darfur leaders in an attempt to reach a common understanding on this matter, and the National Council of Ministers endorsed the creation of East and Central Darfur in early May. However, these moves failed to impress the rebels. Darfur armed movements demanded that Darfur become one region, which could give them an advantage over the central government as they expect to be supported by the majority of Darfurians. That is to say, they could exert more pressure on the government and potentially succeed in future elections. Against this backdrop, Minawi's SLA/MM accused Khartoum of using divide and rule tactics. At the same time, the JEM charged the government with seeking to divide Darfurians along tribal lines and favoring certain tribes over others, so that the government could share power with the tribes it favors in the new two states (in Central Darfur, the Fur tribe, and in East Darfur, Arab tribes such as the Reizegat). They believe the government is seeking ways to weaken the rebel groups and prevent Darfur from following in the footsteps of South Sudan. After all, the region had been an independent sultanate of the Fur tribe until 1916. SLA leader Abdul Wahid makes clear that he does not want secession for Darfur, but he adds that he cannot prevent others considering the possibility under the current circumstances. While the armed groups and the government have been strategically, militarily, and politically positioning themselves, the local population has been the ultimate victim of the ongoing and violent clashes. The hotspots include Jabal Marra, Shangil Tobaya, and Dar al-Salam in north Darfur, Kor Abeche in south Darfur, and Jebel Marra in the center of the province. Government air strikes throughout February 2011 resulted in the deaths of many civilians and the destruction of residential areas in Kabkabiya, Wadi Murra, and Sortony in north Darfur. In May, the intensified SAF airstrikes hit villages in Kutum, Kabkabiya, El Fasher in north Darfur and Shaeria, Nyala in south Darfur in a bid to eradicate rebel movements. Yet despite its absolute air superiority, the Sudan Armed Forces have thus far only been partially successful in taking full control of rebel strongholds, and the real victims of the airstrikes have been civilians. Consequently, camps for internally displaced people, such as the Zam Zam camp in north Darfur, were overloaded with civilians fleeing from air strikes and armed clashes on the ground. According to the U.N. Office for the Coordination of Humanitarian Affairs, nearly 66,000 civilians have been internally displaced since January 2011 as they fled their homes to camps in north and south Darfur. Yet even this desperate move brought little relief to the hapless refugees as the government, viewing the camps as safe havens for the rebels, cracked down on the camps, both militarily and economically by imposing an economic blockade on the supply of basic commodities and fuel (notably in the Zam Zam camp in early April 2011). In addition to Darfur, the referendum results have rekindled other problems between Juba and Khartoum for which the Bashir government will feel increasing heat in the coming months. Among these issues is the status of the Abyei area in south Kordofan, which is particularly important for the governments of both northern and South Sudan because of its rich oil reserves and fertile lands and has become a focal point for violent conflict. According to the 2005 comprehensive peace agreement, the referendum on the future of South Sudan was to be followed by a referendum on Abyei's status to decide whether it should become part of South Sudan or remain in the south Kordofan region of northern Sudan. However, thus far the referendum has not taken place as the issue of eligibility to vote on Abyei's future has not been resolved. Ethnically, Abyei is populated by the Christian Dinka Ngok, who consider themselves part of South Sudan and are supported by the Sudan People's Liberation Movement. According to the peace agreement, only the Dinka were supposed to vote. However, with a view to diluting the region's heavily African identity by injecting an Arab population, Khartoum settled thousands of nomadic Arab Muslims, the Misseriya, who travel to Abyei regularly during the dry season to graze their cattle. Given Bashir's declaration in late March 2011 that the referendum would only be held with Misseriya participation, it is clear that the north will continue to fight for the territory from which it derives substantial oil revenues. Consequently, the South Sudan government has accused the north of arming the Misseriya and using its paramilitary Popular Defense Forces for raids in Abyei villages. According to U.N. reports, attacks against the Dinka led 20,000-25,000 people to flee to the south. U.N. civilian protection officials assert that by March 16, 2011, clashes between rival communities had claimed more than one hundred lives in Abyei. While the Sudan People's Liberation Movement held Khartoum responsible for the tensions, the northern government argued that the clashes are due to the south's internal problems. The Misseriya, on the other hand, argued that the Sudan People's Liberation Army (SPLA) deployed forces disguised as police in Abyei and that these forces attacked them and blocked their migration route. Indeed, the combatant indicators evinced a further increase in the spiral of violence in the territory as recent satellite imagery showed a military buildup in the area. The Harvard Humanitarian Initiative warned that Khartoum was deploying extra security forces in Abyei. By the same token, the commander of the United Nations Mission in Sudan, Maj. Gen. Moses Obi, announced that both the north and south had deployed forces with heavy weapons to the region. Juba and Khartoum agreed to resolve the issue before the south's official independence in July, and Misseriya and Dinka Ngok tribes signed the Kadugli agreement in mid-January to stop the fighting. Yet, these initiatives were not fruitful. Consequently, May 2011 witnessed clashes in Abyei resulting in the deaths of fourteen people followed by SPLM's ambush of a convoy of northern troops and U.N. peacekeepers in which twenty-two SAF soldiers died and which led to the occupation of the area by heavily armed northern troops. According to U.N. officials, nearly 100,000 people, most of them Dinka Ngoks, had to flee from their homes as a result. The Abyei crisis is only a part of a bigger dispute between the south and the north over the oil-producing state of south Kordofan. Similar to the developments in Abyei, the tension in the region was building. Several incidents created further strains, such as SPLM's allegations against Bashir's National Congress Party of fraud in the southern Kordofan gubernatorial elections and Khartoum's June 1, 2011 ultimatum to SPLA forces to leave the region and the Blue Nile. Consequently, the increase in violence in and around the state capital Kadugli forced an estimated 40,000 people to flee. The turmoil in south Kordofan poses a new security threat in Sudan as it may expand the battleground from the Darfur conflict, owing to the activities of certain rebel groups in both regions. JEM, whose agenda has always been nationwide and who has close relations with SPLM, has increased activity in the region. Further, JEM is said to be recruiting Arab Misseriya youth unhappy with the government. In the past, the group played an active role in several attacks, such as in Hamrat al-Sheikh in north Kordofan in July 2006, in Wad Banda in west Kordofan in August 2007, against Chinese oil operations in south Kordofan (October and December 2007), and most recently, against an airport used by Chinese oil companies in Heglieg in June 2011. Consequently, JEM's agenda seems to be the integration of anti-government forces in Darfur and south Kordofan—regardless of their ethnic background—and fighting against Khartoum nationwide. Despite the gloomy picture and Bashir's threats not to recognize the south's independence if it persists in claiming rights over Abyei, the separation of South Sudan took place on July 9, 2011. From the northern perspective, the south's independence will have a constructive impact on Bashir's government in the international arena because of his positive approach to the referendum and his acceptance of the results. From the southern perspective, the south will not risk its independence at this stage by engaging in all-out war with the north. Nevertheless, the level of violence between southern and northern forces as well as their proxies is highly likely to escalate in the contentious areas of southern Kordofan and Darfur in the coming days. In an attempt to gain leverage, the leaders of both South and northern Sudan hurled accusations at each other of using proxies to further destabilize their respective governments. Khartoum has continuously warned Juba not to support the Darfur movements, which in turn means escalation of violence in the region and further instability for northern Sudan in general. On the other hand, the Sudan People's Liberation Movement claims to have evidence that Khartoum supplied southern rebels with weapons, so as to enable them to remove the new southern government from power before the official declaration of independence. Since the January referendum, several SPLM defectors, such as Gen. George Athor, Col. Matthew Puol Jang, and most recently Gen. Peter Gadet have been fighting against the Sudan People's Liberation Army. Given the region's poor infrastructure, the heavily armed population, fast spawning SPLA defectors, and the weak government, South Sudan is in danger of being dragged into a civil war especially if the opposing groups receive external support. Another outstanding issue brought to the fore by the southern secession is that of border demarcation between the north and the south. According to the 2005 peace agreement, a precise demarcation of this border in line with the January 1, 1956 frontier of Sudan's independence day should be agreed upon between the parties. However, the Technical Border Committee established to resolve the issue could not solve all of the border problems between the two parties. Unsatisfied with the current arrangement, the southerners argue that the River Kiir/Bahr al-Arab should constitute the border between the two countries, requiring the north to make territorial concessions. The south has also argued that the mineral-rich Kafia Kingi area, in the horn of southern Darfur, historically belonged to South Sudan. The other contentious border disputes between the northerners and the southerners are between the Sudanese states of the Upper Nile and the White Nile and between the Upper Nile and south Kordofan. These issues are likely to contribute to further armed clashes in the near future unless a flexible solution, such as the recognition of soft borders between the two states, is rapidly implemented. The January 2011 referendum has rekindled old conflicts and created new bones of contention. Khartoum will have to deal with the rebel movements in both Darfur and south Kordofan, which are both likely to continue supporting each other against their mutual adversary. Khartoum will also have to establish a working relationship with the independent government of South Sudan despite the existence of several unresolved issues. Any retaliatory measures by the northern government are liable to produce further instability, not only for its adversaries but also for northern Sudan. More than ever before, the Sudanese government is confronted with a string of ticking time bombs, ready to explode at the first available opportunity. Damla Aras is post-doctoral research associate in war studies at King's College London, currently serving with African Union/United Nations Hybrid Operation in Darfur (UNAMID). Any views or opinions presented in this essay are solely those of the author and do not represent those of UNAMID. Julie Flint, "Darfur's Armed Movements," in Alex de Waal, ed., War in Darfur and the Search for Peace (Cambridge, Mass. : Harvard University Press, 2007), pp. 148, 160. Agence France-Presse, Nov. 13, 2010; Bloomberg News, Jan. 5, 2011. Agence France-Presse, Mar. 23, 2011. Radio Dabanga (Darfur), Mar. 22, 23, 2011. Sudan Tribune (Paris), May 16, 2011. SudanJem.com (Sudan Justice and Equality Movement), Mar. 28, 2011. Sudan Tribune, May 10, 2011. Terrorism Monitor (Jamestown Foundation, Washington, D.C.), June 2, 2011. Sudan Tribune, July 31, 2010. Sudan Vision Daily (Khartoum), Mar. 24, 2011. Agence France-Presse, May 5, 2011. Sudan Tribune, May 5, 2011. Sudan Vision Daily, Mar. 24, 2011; The Independent (London), Mar. 18, 2011. Edward Thomas, The Kafia Kingi Enclave (London: Rift Valley Institute, 2010), p. 28. Terrorism Monitor, June 2, 2011. Sudan Tribune, Mar. 9, 2011. Agence France-Presse, May 18, 2011. U.N. Integrated Regional Information Networks via COMTEX, Mar. 16, 2011. Radio Dabanga, Apr. 5, 2011. Sudan Tribune, Apr. 1, 2011. Ibid., Apr. 4, 2011; Associated Press, Mar. 23, 2011; U.N. News Center, New York, Mar. 16, 2011. Sudan Tribune, Feb. 28, 2011. Sudan Tribune, Jan. 29, 2011. Agence France-Presse, May 3, 2011; Reuters, May 30, 2011. Agence France-Presse, June 12, 2011. Small Arms Survey (Graduate Institute of International and Development Studies, Geneva), June 4, 2011. Jerome Tubiana, "Renouncing the Rebels: Local and Regional Dimensions of Chad–Sudan Rapprochement," Norwegian Ministry of Foreign Affairs, Mar. 2011, p. 61; Sudan Tribune, June 14, 2011. Radio Miraya (U.N. Mission in Sudan and Swiss NGO Fondation Hirondelle, Juba and Khartoum), Mar. 23, 2011. Xinhua News Agency (Beijing), Mar. 31, 2011; Agence France-Presse, May 21, 2011. Related Topics: Damla Aras | Fall 2011 MEQ receive the latest by email: subscribe to the free mef mailing list This text may be reposted or forwarded so long as it is presented as an integral whole with complete and accurate information provided about its author, date, place of publication, and original URL.